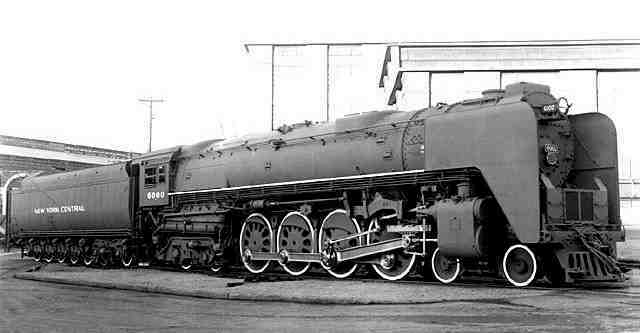 Most steam locomotives like the one in the link below use something called "elephant ears." What these do, from what I can tell and have heard, that they keep the smoke/steam from getting too far away (horizontaly) from the boiler which would block vision. Instead it diverts it upward (verticaly) into the sky so the conductor/engineer can see ahead of them. It could also make some aerodynamics on the locomotve too I have heard. Most larger locomotives use these, shunters don't usually have them. The picture above is a NYC (New York Cental) Niagara, which elephant eats were defaut to the design. It was a 4-8-4 wheel arrangement so I would said anything above that would have elephant ears. Man, I am full of information today. Just a small update, I've begun the scenery on one half of my model railroad that includes a new line, some rugged terrain for my 3 truck shay and a relocation of my coal mine, also a small lake. PS. I have also added 3 background boards that will be painted by my dear mother when she finds the time, but they are installed and made to be removable in under 10 minutes! Whenever I'm stuck at a level crossing, they appear to have gone for a new record with the amount of wagons they've put on. Lorin, what happened to those photos? BTW guys, I've officially said goodbye to the Auran forums. That place is a shadow of what it was, and I don't enjoy it there at all anymore. I'm hoping to get back into Trainz in the next couple of weeks, and maybe even buy TS2009 now that there appears to be a user workaround. Hope all goes well with the move Ish. I got side tracked with computer problems I had to fix, but should be getting back to the model soon, BTW totally agree with the other forum thing, I just check for updates, that's about all now! Haven't posted for a while, bit busy. Nice to hear from you Smiley. So far 09 is working out OK. Still has a that annoying habit of limiting the size of a route created in Transdem, no matter what computer specs you have. Apart from that I haven't had too many problems with it. The new CMP is also a big improvement over the last one. Couple of features missing from the old version which I would have liked to see retained, but we can't have everything . Like most of us, I'm also using Auran less. Just checking out my e-mail notifications, which are now getting few and far between, and Geophil's thread to see the advancements made towards the Transdem 09 update. I think once this occurs, my visits to Auran will be non-existing. As some of you may know I'm building a new game rig from scratch, this will be a high end machine intended for serious gaming and won't be a cheap build. I have been collecting parts for a couple months as money is tight and I can't just do this in one shot, so far I have a full atx tower, cpu fan, and a superclocked GTX 280 gfx card for the build. The reason for this post is to announce painfully that I will be selling my model railroad and some of the rolling stock to help this computer build. I will however be holding back some steam engines like my CN Hudson, Mikado, 3truck shay and a couple pieces that are hand painted....also my kids Thomas stuff! This is what happens when a man has too many hobbies in these troubled times in the world! Fear not, when I move "again" in the spring I'll start over possibly on an L shaped HO route if I have the room in the other house! Too many hobbies, not enough money, and not enough time. Because I'm waiting on Auran to fix TS09 for my particular problem (I'm still hoping), I've moved pretty much all my spare time onto coding, and being knee-deep in page after page of C++ is just as much fun as Trainz. Good luck selling your models and building your new rig. Thanks Smiley, I'm sure it will all come together with some patience, ohh wait I don't have any of that!